What began as a bit of fun for the occasionally frustrated workers at a cafe in the French city of Nice is sticking around on the menu, with customers being charged more for coffee if they fail to ask nicely. For those who aren’t conversant in French, the above sign lists three prices for coffee. The first is €7 ($9.64) for people who merely grunt “un café” when they order. The next tier of pricing is €4.25 ($5.85) for those who politely add a “s’il vous plaît” to their order. 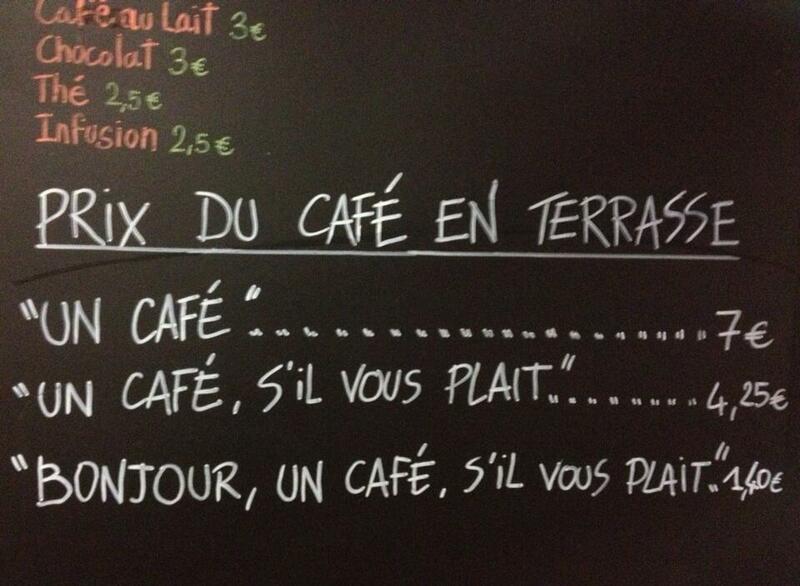 And if you can be extra polite and throw in a “Bonjour” and a “s’il vous plaît,” you’ll only pay €1.40 ($1.93). The owner says he hasn’t yet been compelled to charge anyone the higher price and that the sign has resulted in his regular customers now being overly polite when they order. “They started calling me ‘your greatness’ when they saw the sign,” he says.